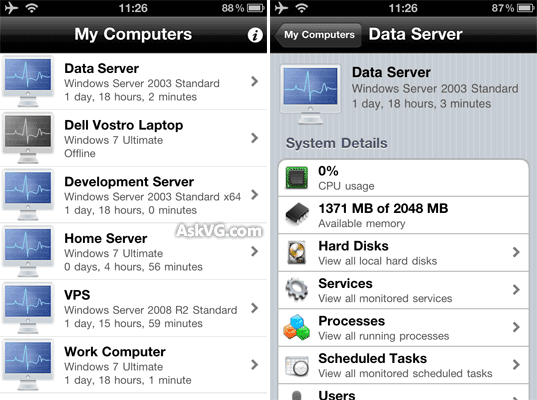 "PC Monitor" is a free and small application which allows you to monitor and manage your computer right from your iPhone, iPad, Android phone or Windows Phone 7. The monitoring process is very secure and uses SSL connection for both computer and mobile device. You simply need to install the free software on your computer which you want to monitor and then you can monitor it using your mobile device with the help of the small PC Monitor app. You can monitor almost everything of your PC. You can check RAM and CPU usage, you can view hard disk content, services list. You can even view all logged in users. It also allows you to control processes, scheduled tasks, etc on the computer system. In fact, you can log off, restart, hibernate or shut down the system remotely. It supports Windows XP, Vista and 7. Also Windows Server 2003, 2008 and 2008 R2 are supported. The free version allows you to monitor up to 3 computers.